Sparkles Family Fun Centers have been the leaders in Family Entertainment in the Atlanta area since 1959. Our motto of Clean, Fun, Friendly and Safe family entertainment has been the mission statement of our business for 55 years! 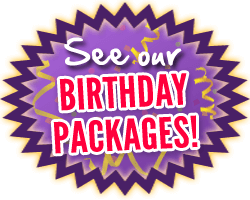 We do it all, from birthday parties and school field trips to and a variety of group outings. Sparkles has something for everyone!